Morning all! I wore this outfit on Sunday, and thought I'd share it with you all as I loved it. We had a family day/dinner thing in my house, so I dressed up for the occasion. 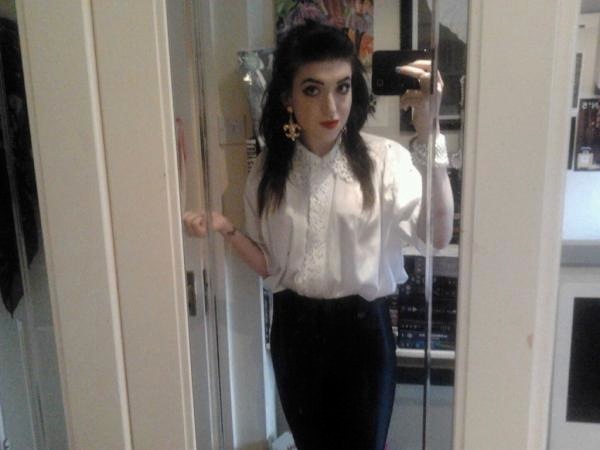 The whole outfit's very New Romantic inspired, and I'm absolutely delighted with it. 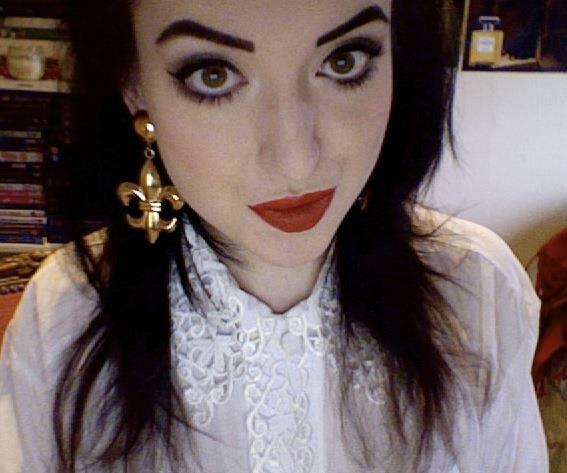 I wore my vintage silk shirt shirt, American Apparel Disco Pants and my Asos 'Fleur De Lys' earrings. It's absolutely freeeeezing here in Dublin at the mo, so I popped my new Asos tartan cape on over it also - which I adore! My makeup's my classic pin up look, with a subtle brown smokey eye. I used Urban Decay's NAKED2 palette mostly on the eyes, and I'm wearing Eyeko's Liptastik 'Lip Lover' on my lips. I'm currently having a bad time with my hair, I'm stuck between styles and colours. I like it black, but I have a sudden urge to do something crazy with it. I just popped my fringe up in a quiff, and let the rest down. Nothing special, it's trés boring! Sorry for the mirror outfit pic, I was in a rush to help with dinner and took it in a hurry!